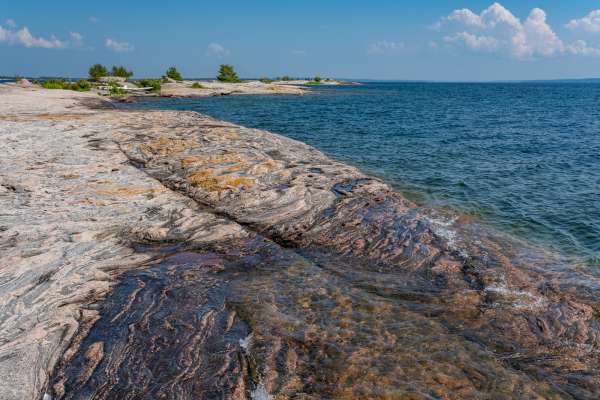 A large island of pink and gray Precambrian granite undulates gradually toward glistening water with blue-green hues more reminiscent of seaside than lakeshore. White birch and pine trees shoot up from the bedrock, their evergreen branches creating pockets of shade. 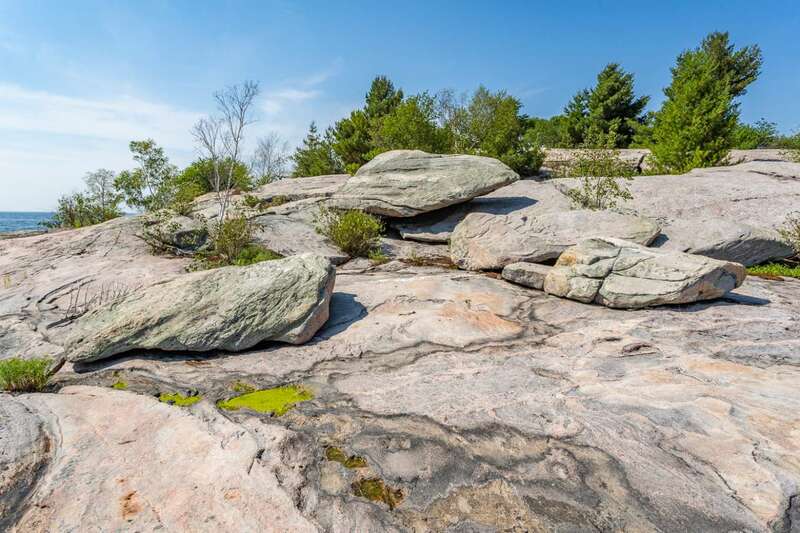 Several massive boulders are strewn across the landscape, leftovers from glaciers that receded during the last ice age. 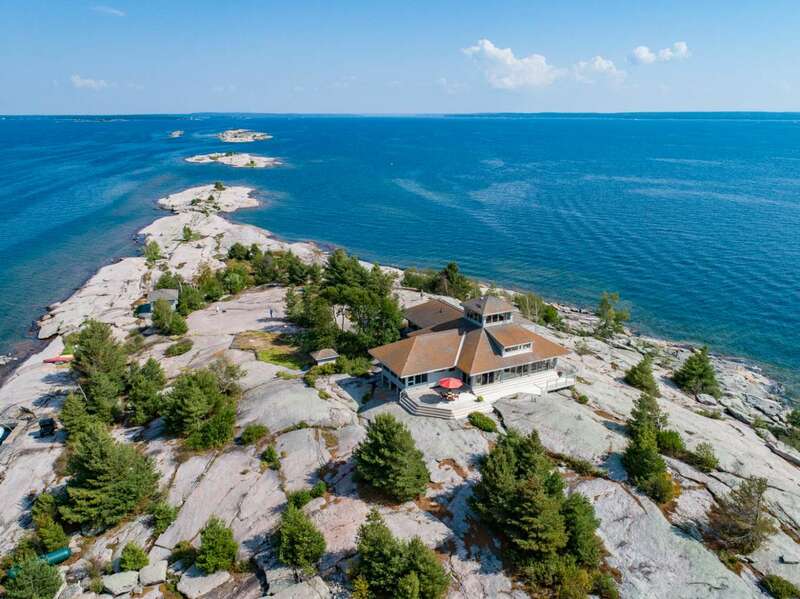 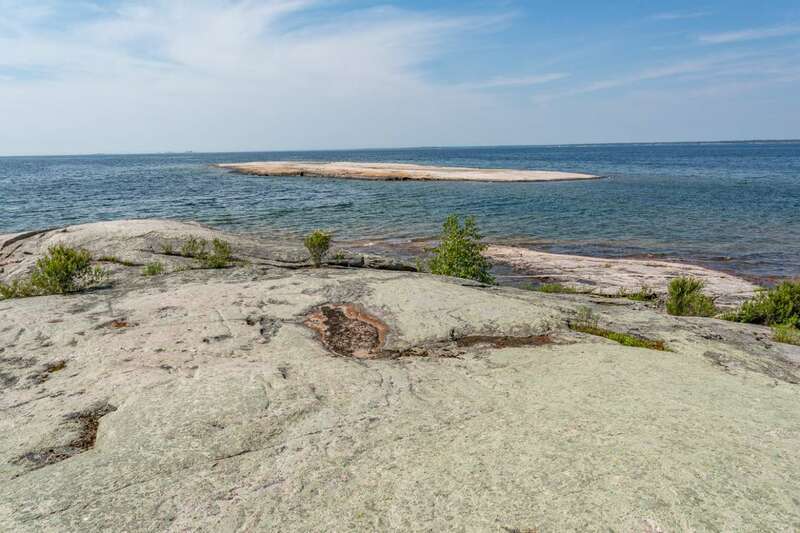 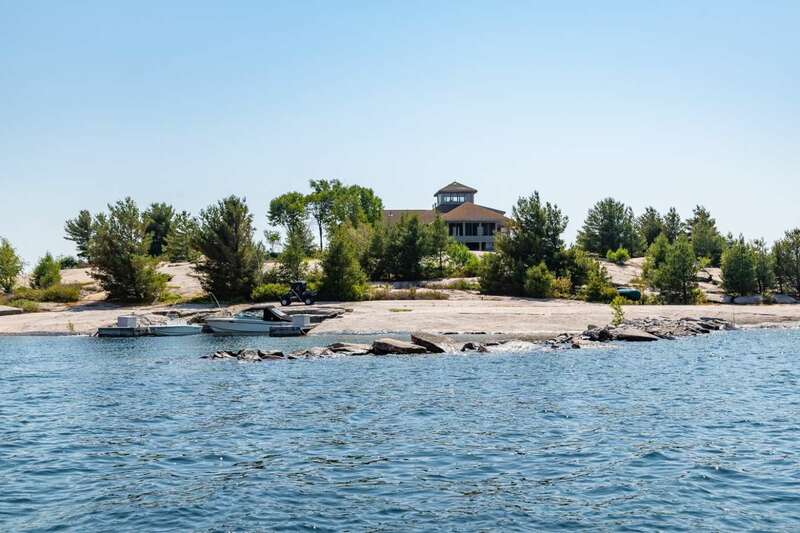 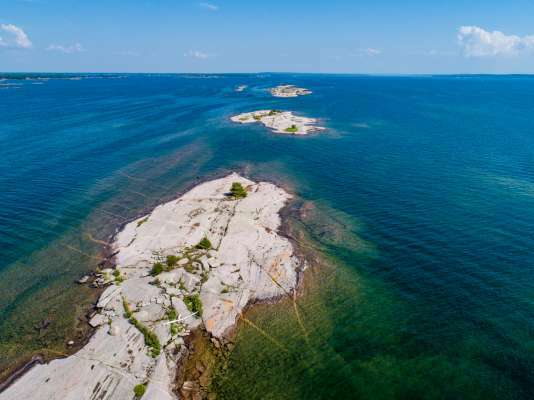 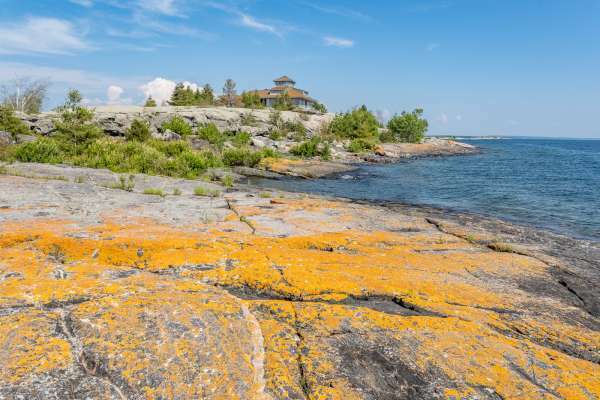 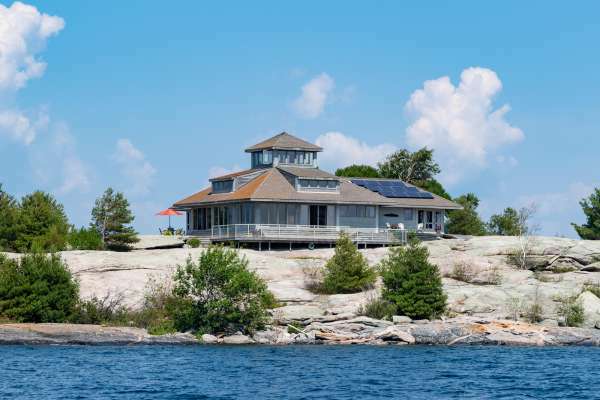 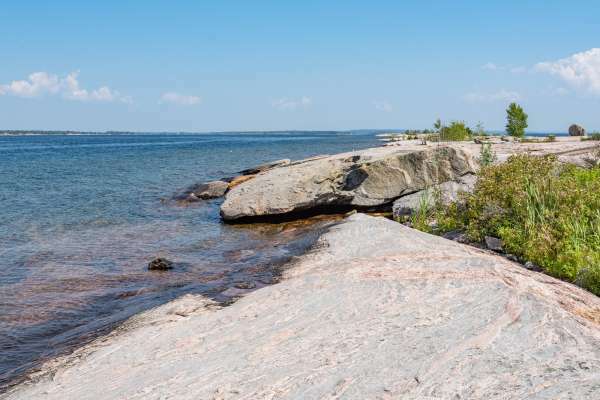 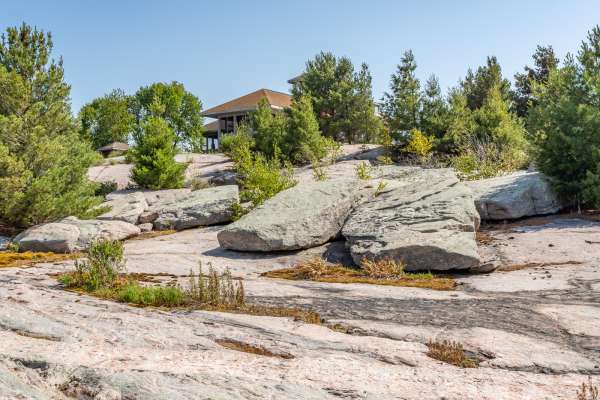 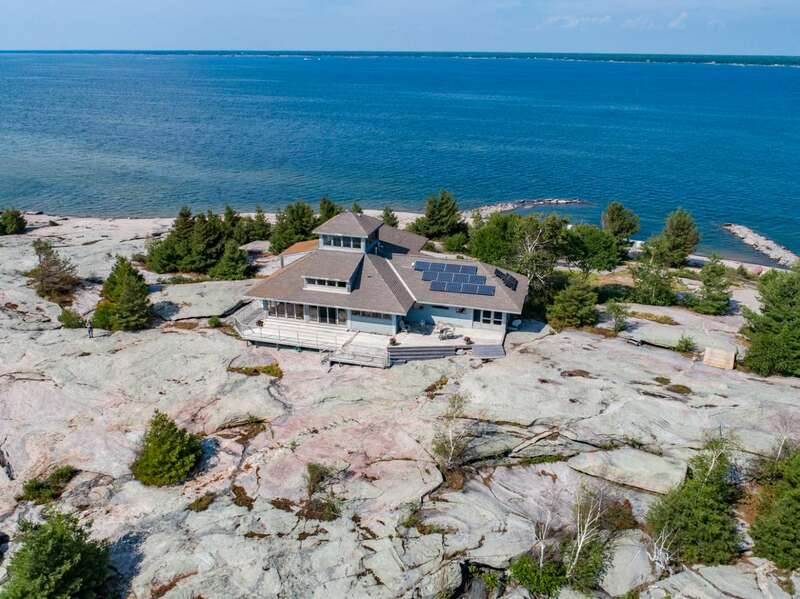 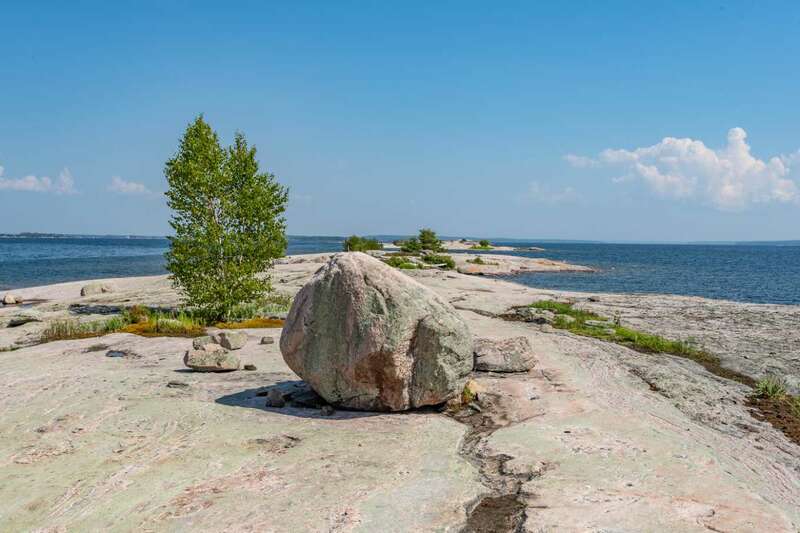 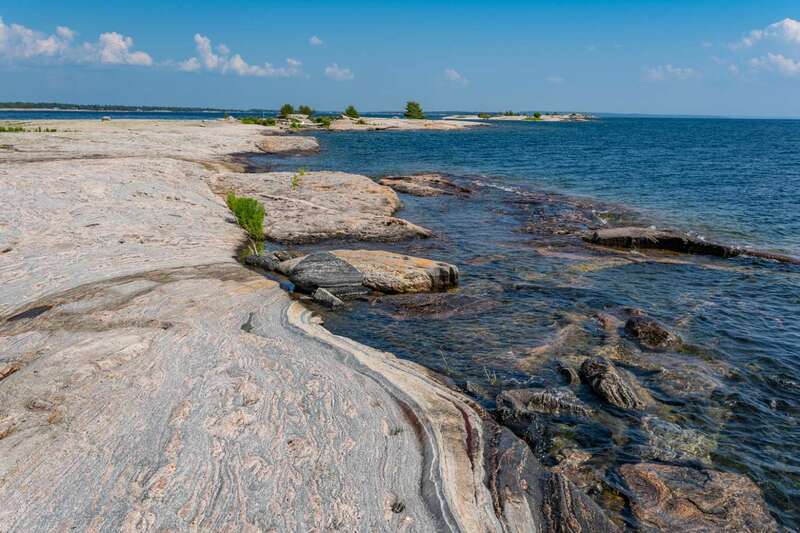 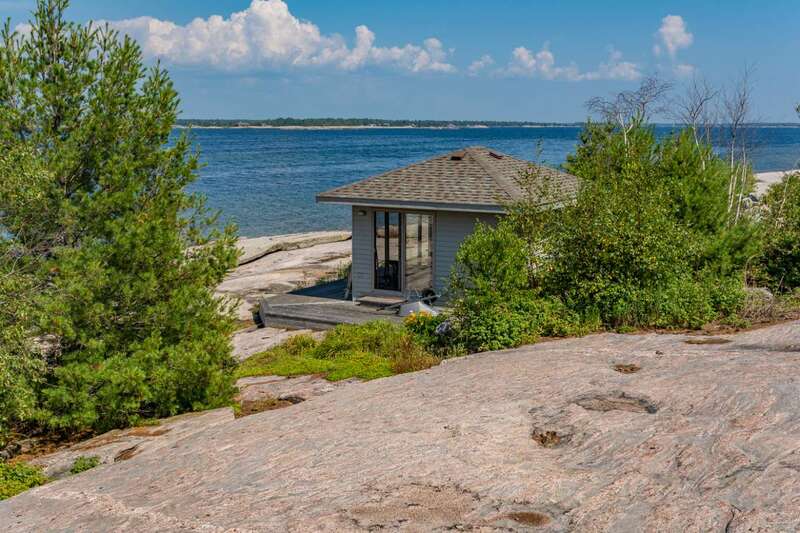 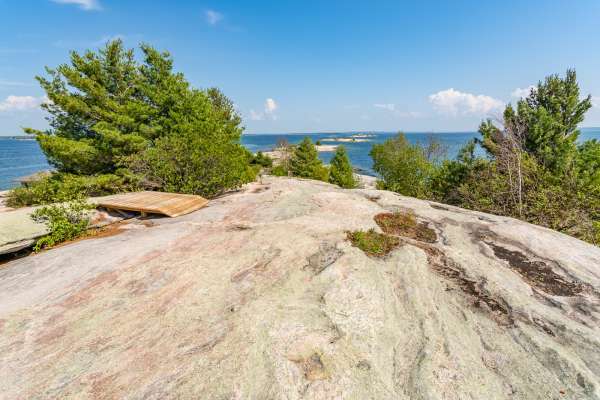 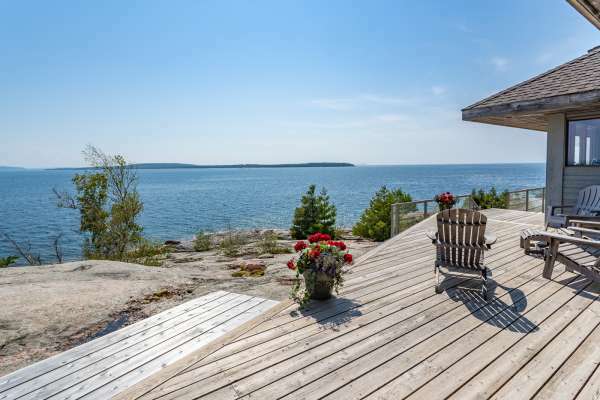 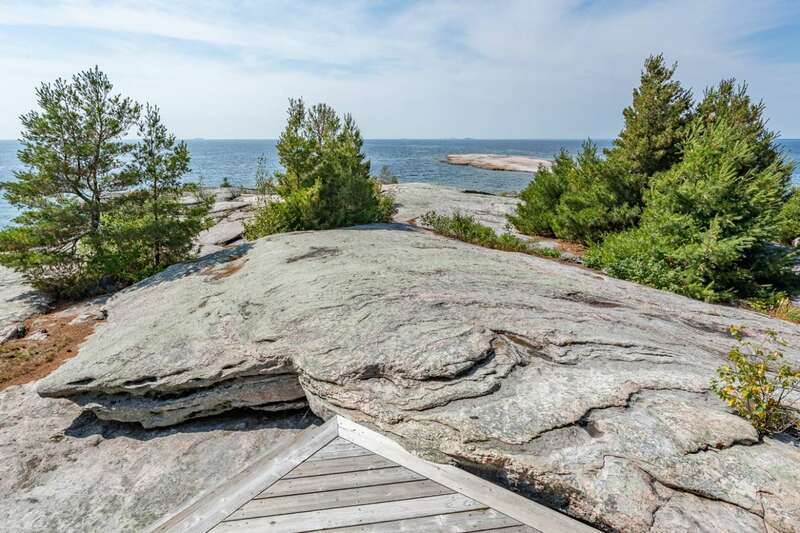 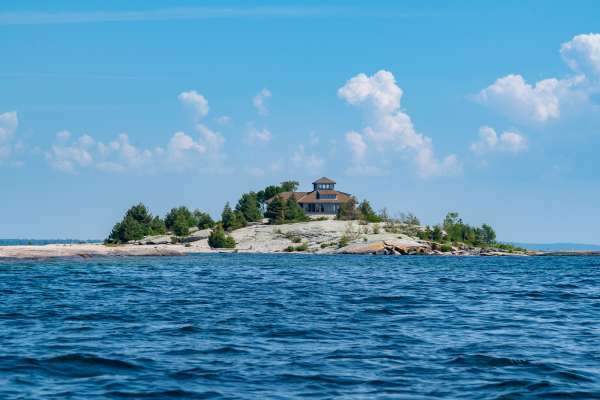 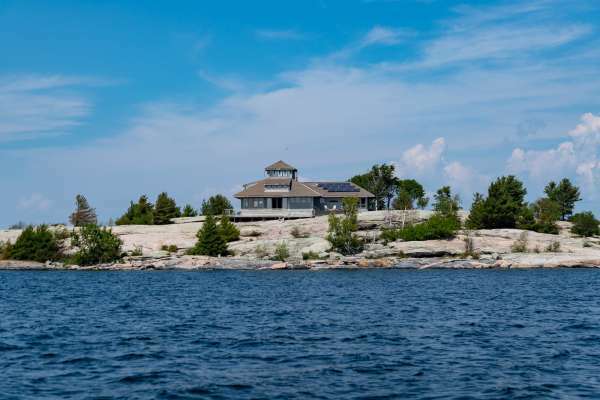 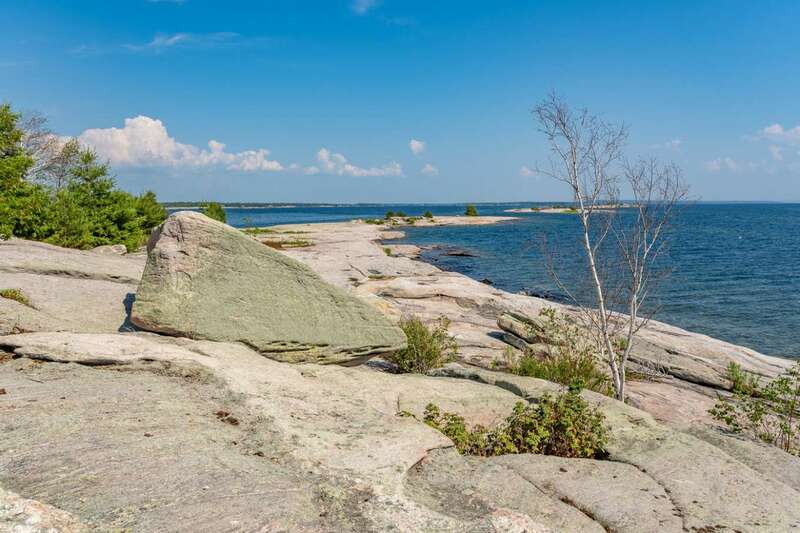 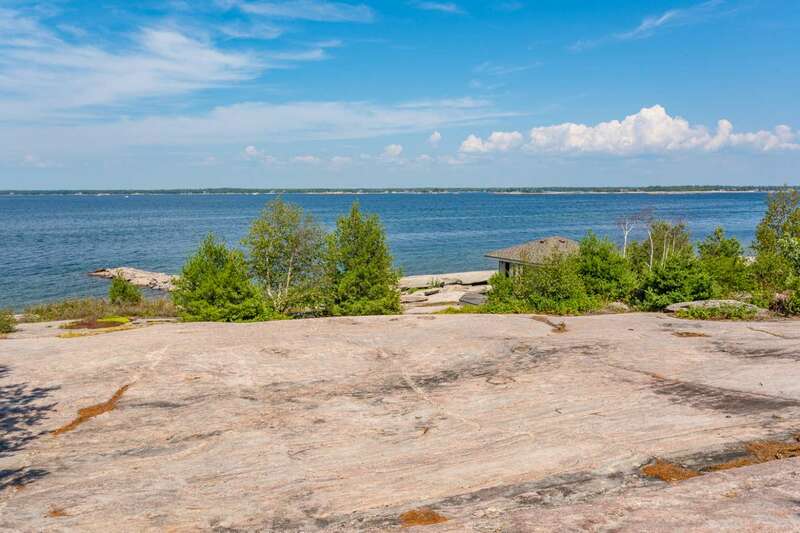 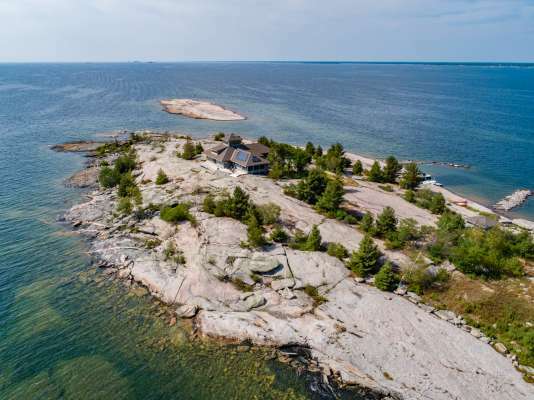 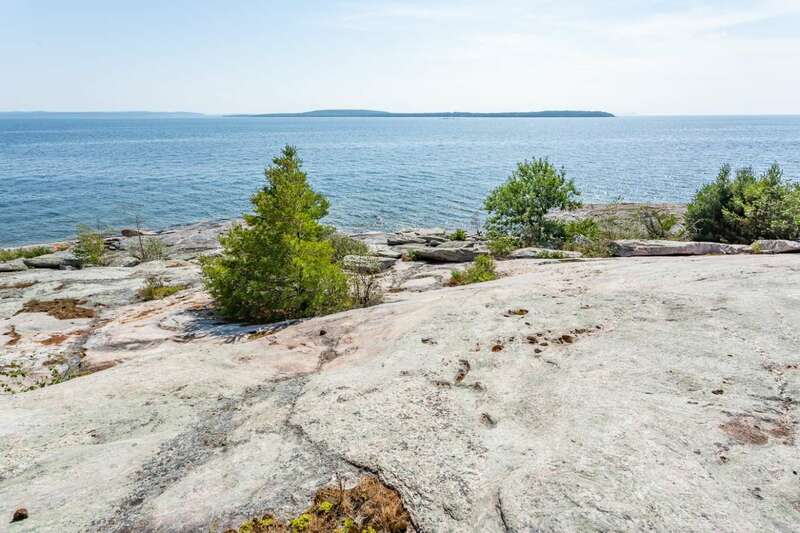 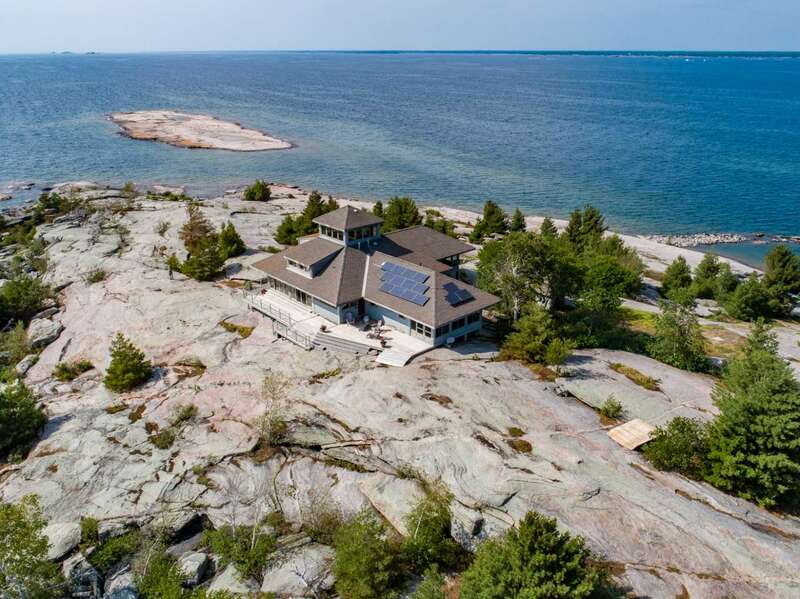 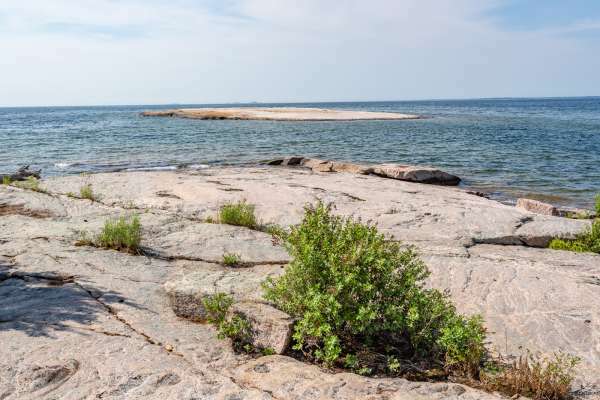 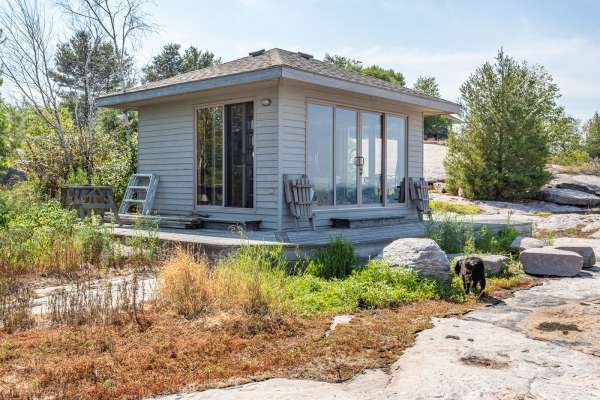 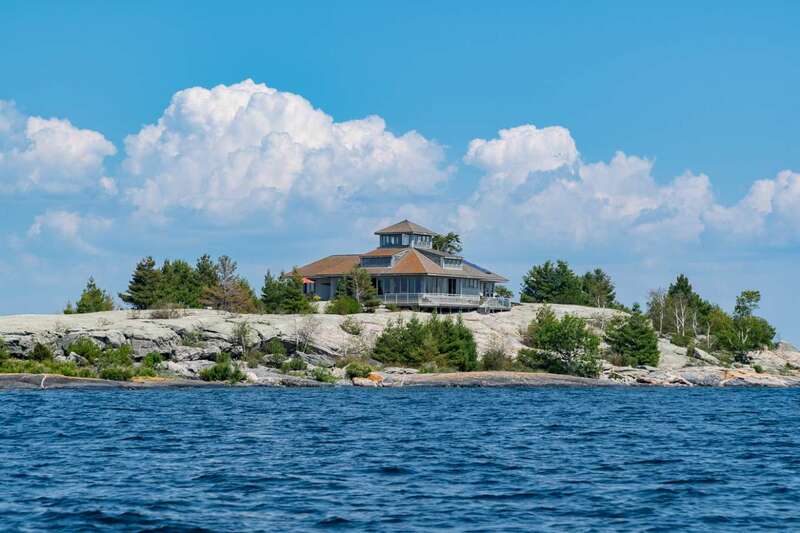 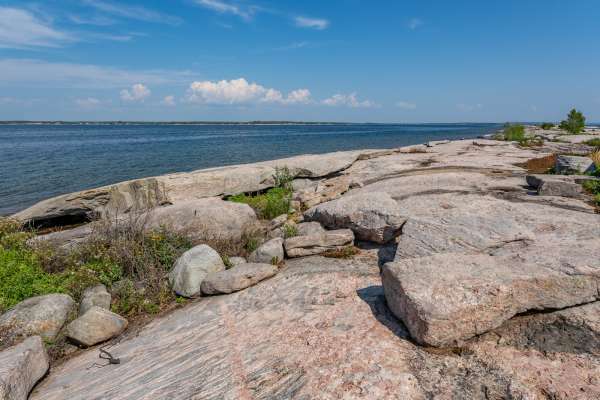 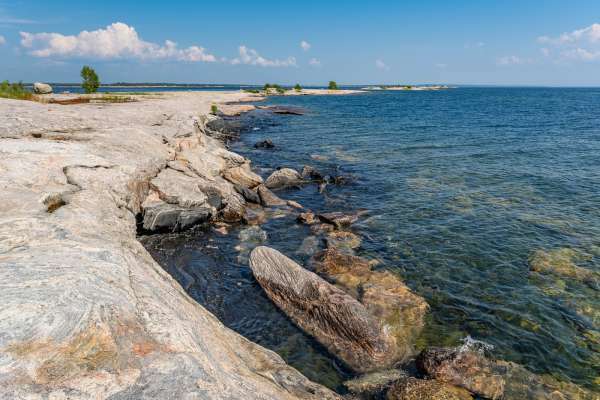 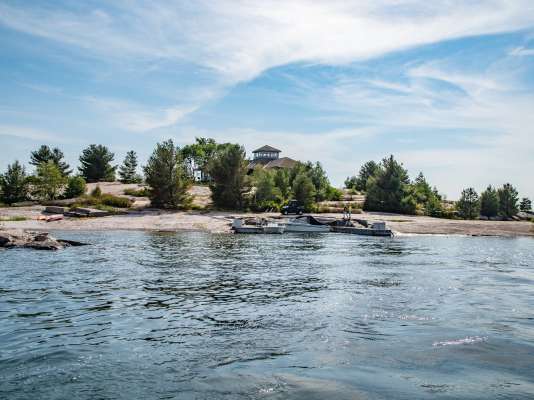 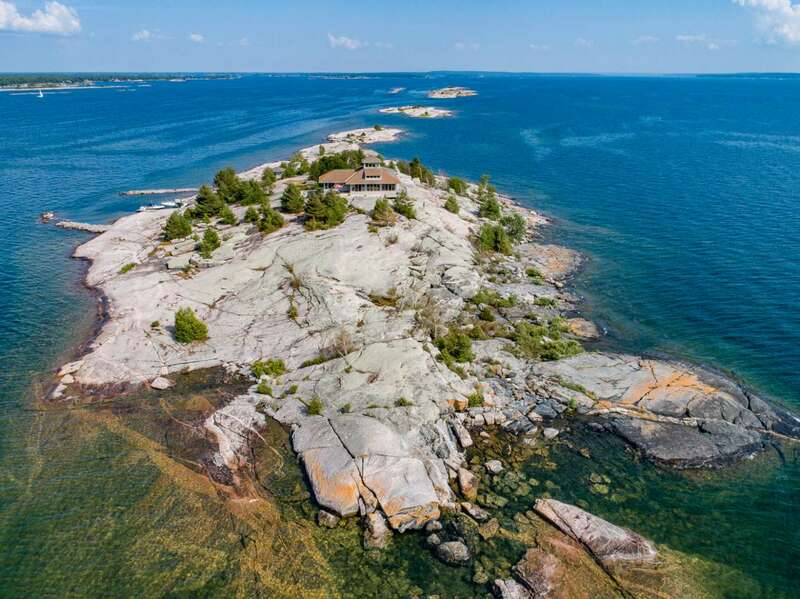 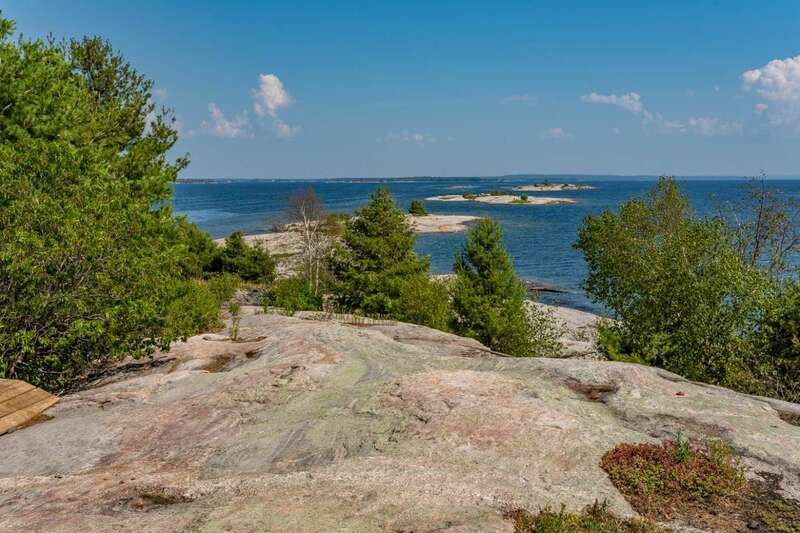 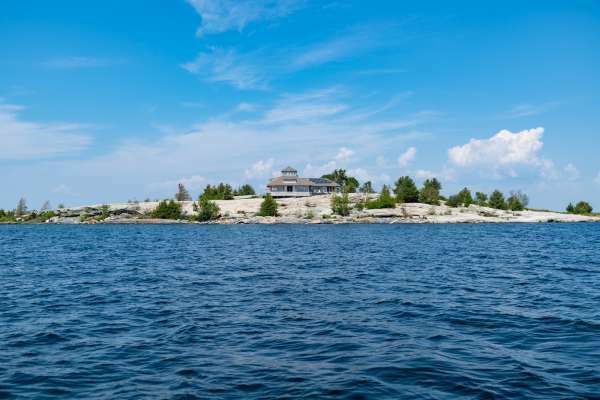 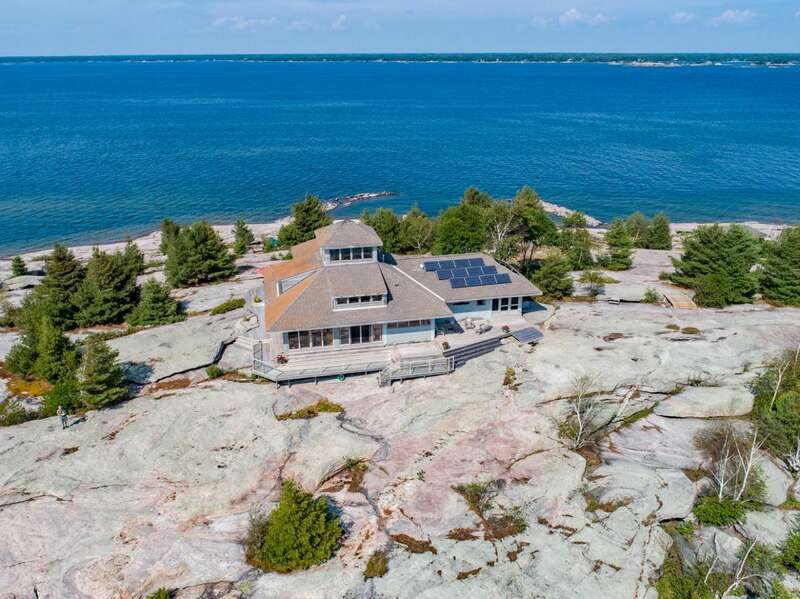 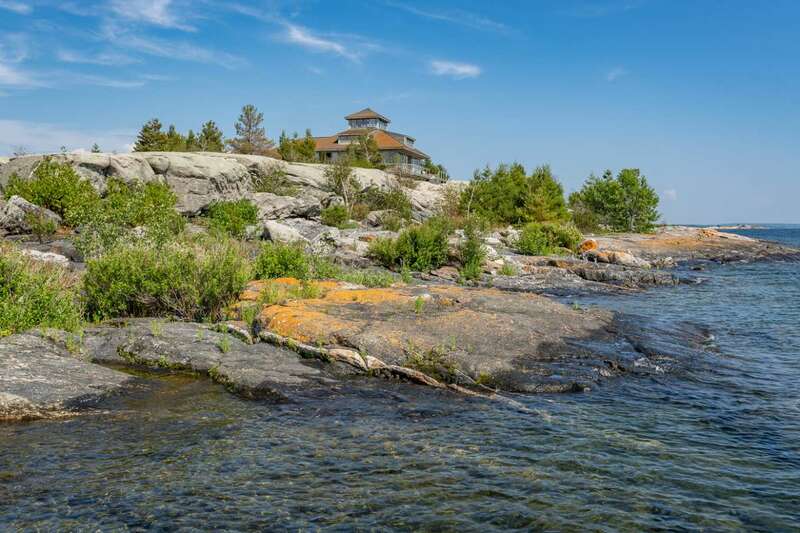 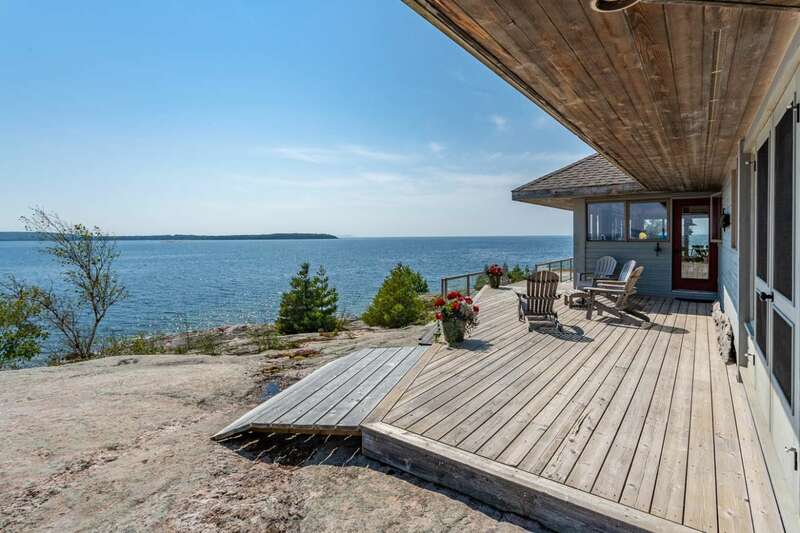 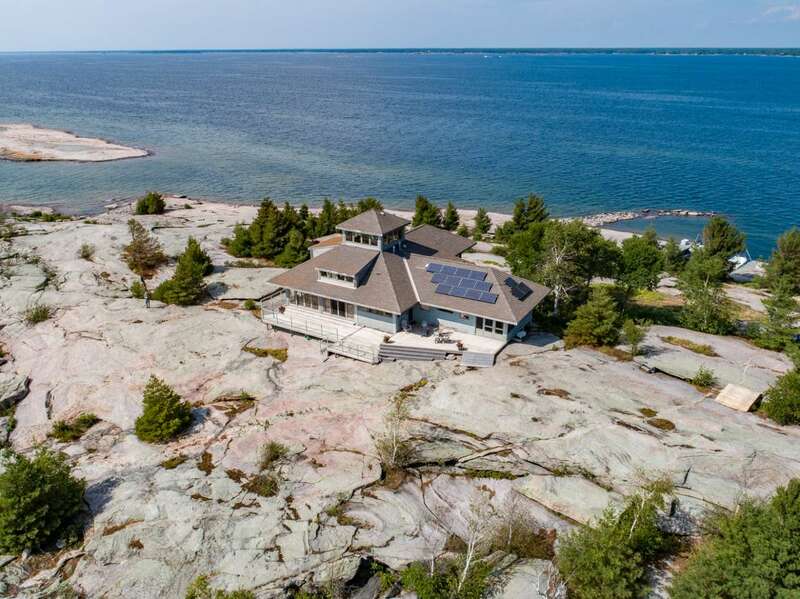 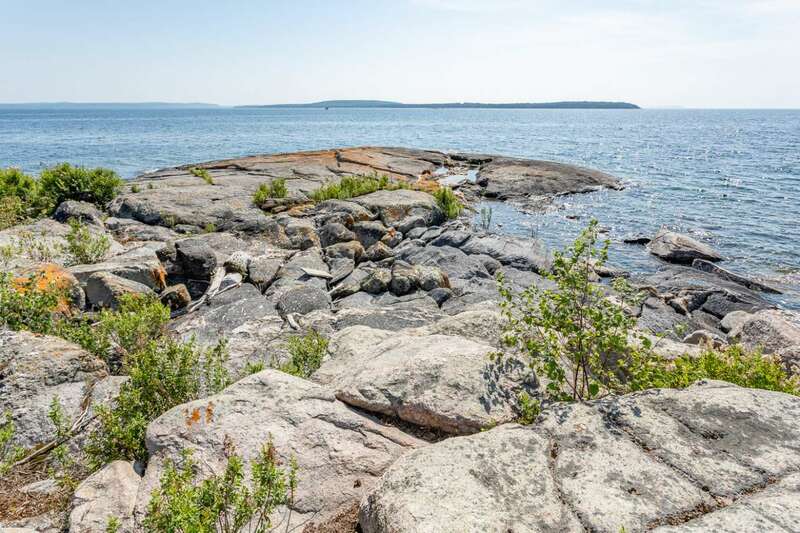 The setting encapsulates the most iconic terrain of Georgian Bay, Ontario—amplified by the addition of a trio of small companion islands, stretching from the main island’s tip further into the bay like stepping stones. 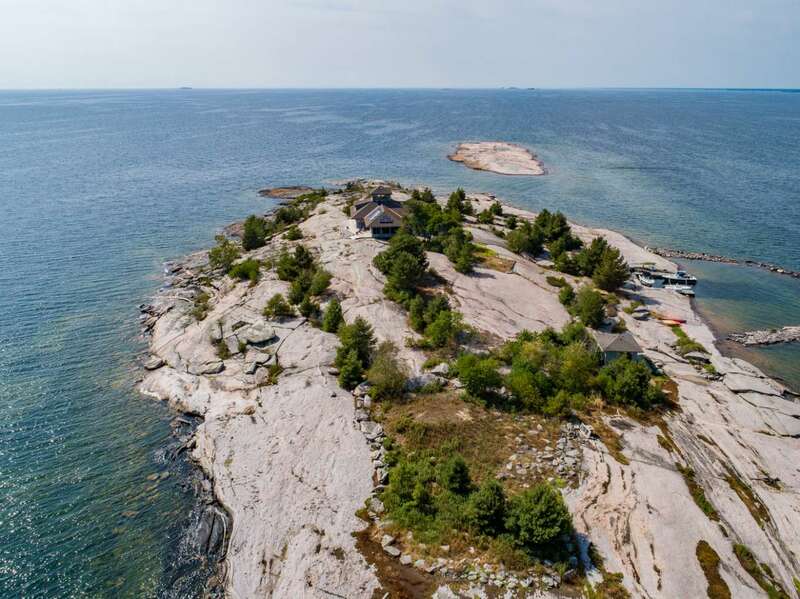 This stunning four-island archipelago, which encompasses 17 acres and has a man-made protected harbor, is now on the market for the first time in three decades. 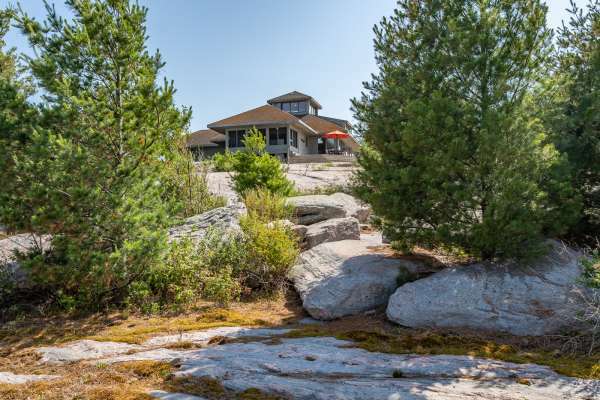 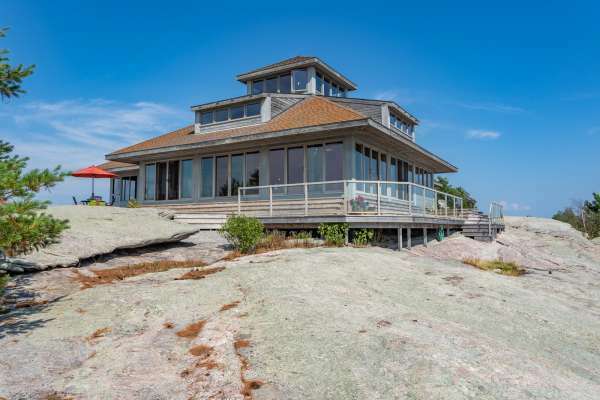 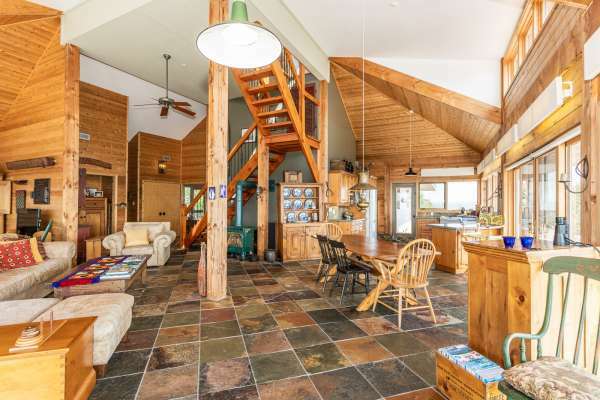 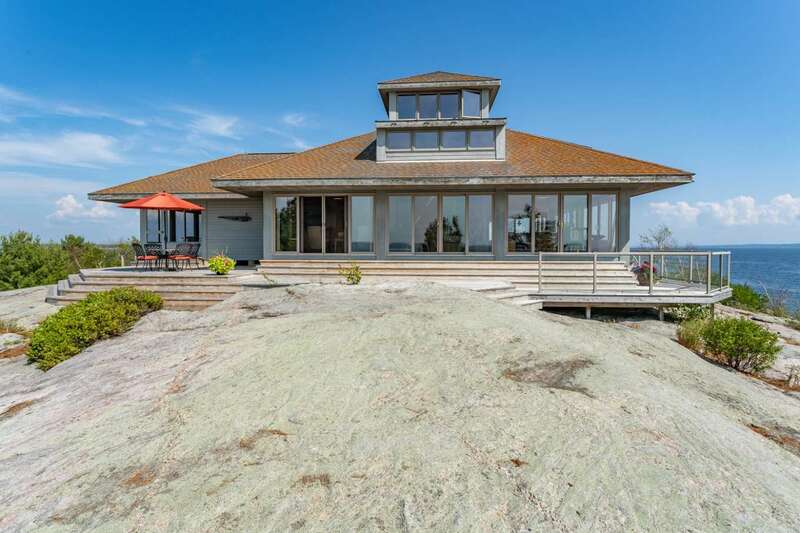 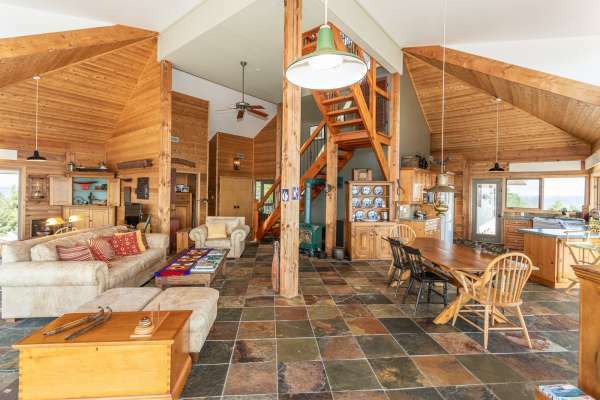 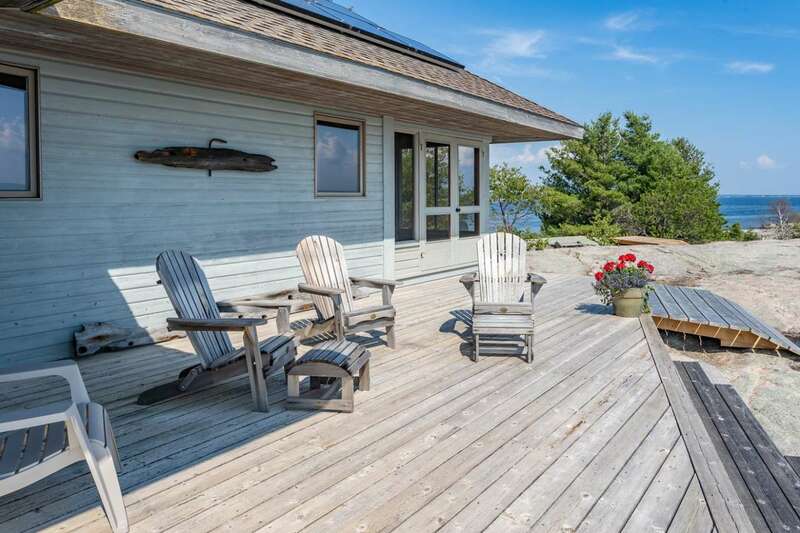 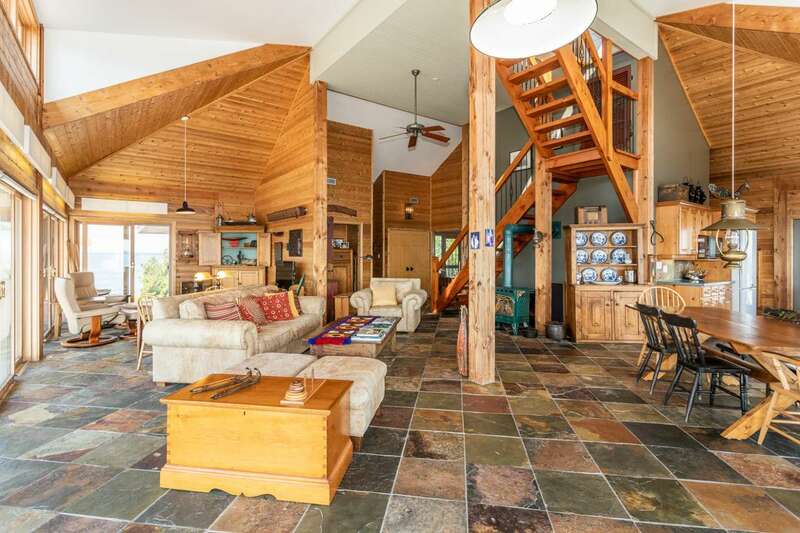 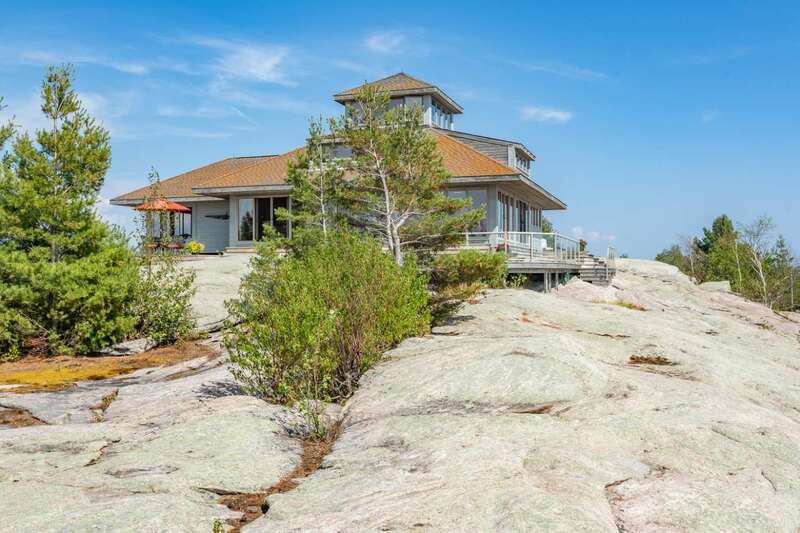 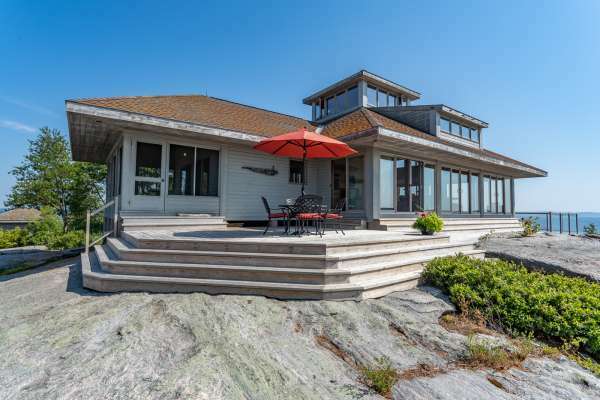 The property is easily accessible from Honey Harbour or King Bay Marina, key launching points to the splendors of Georgian Bay; yet holds an outer position, about two miles west of Cognashene, ensuring privacy. 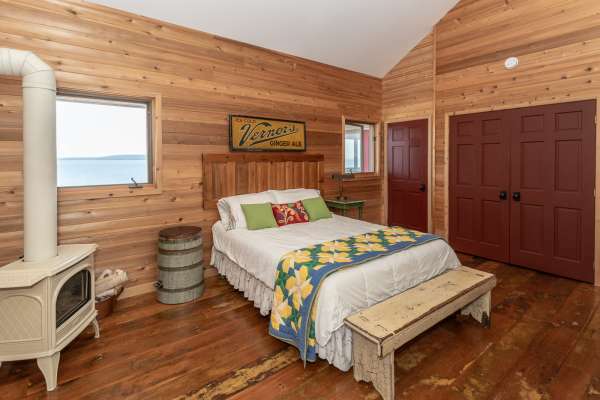 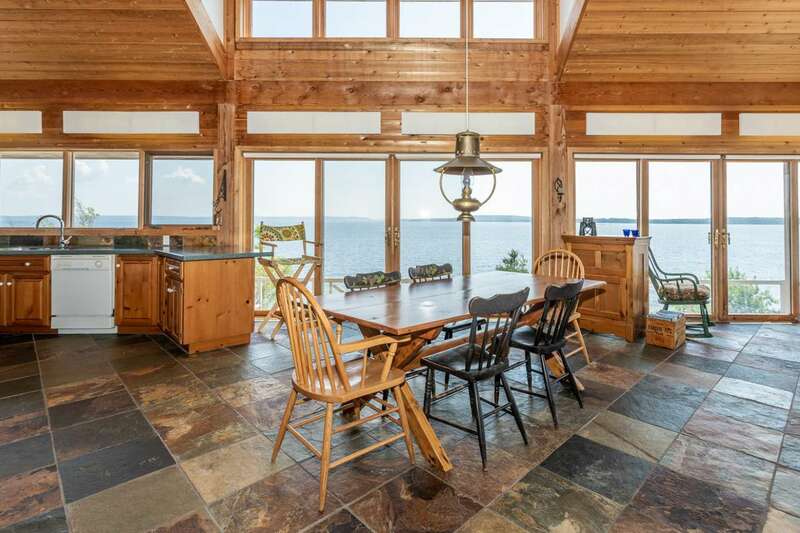 Eshpabekong Island, the largest in this quartet at 10.5 acres, is the site of a 2,575-square-foot, one-and-a-half story timber frame cottage—rustic luxury at its finest. 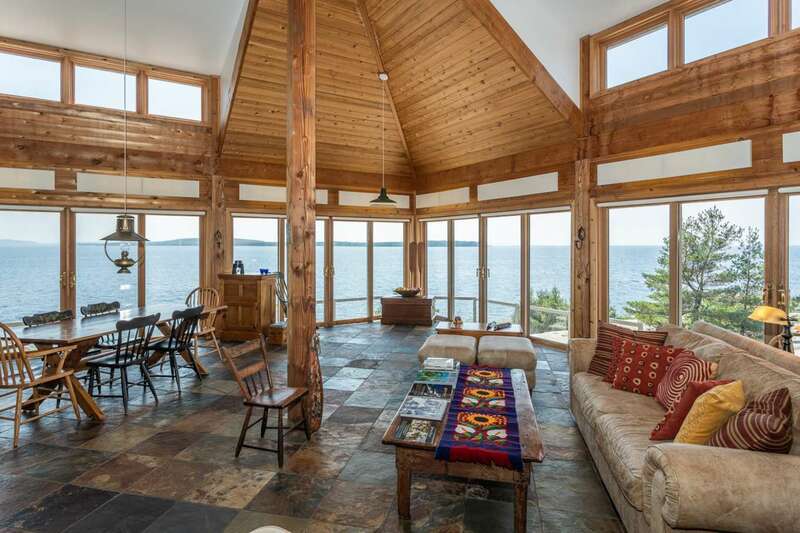 Wraparound cedar decks deliver 360-degree water views, and the home’s interiors equally complement the lakefront setting, with V-match cedar walls, high ceilings, Chinese slate floors and generous window placement to flood the space with light. 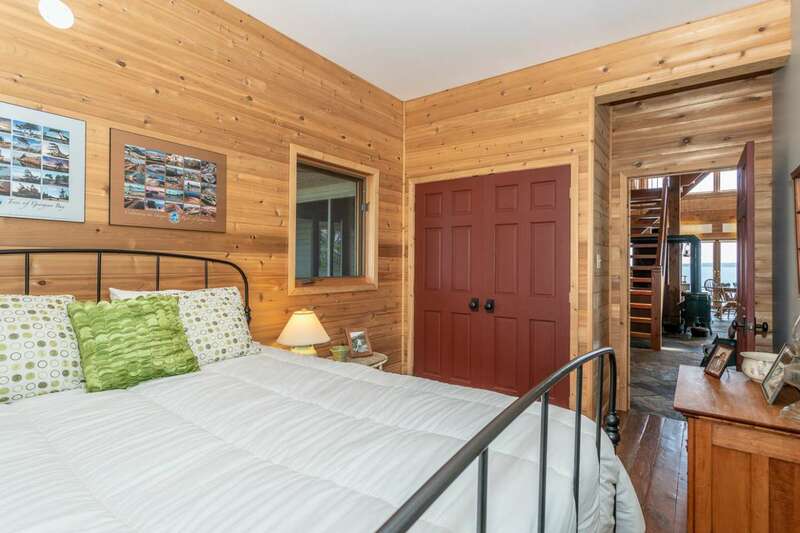 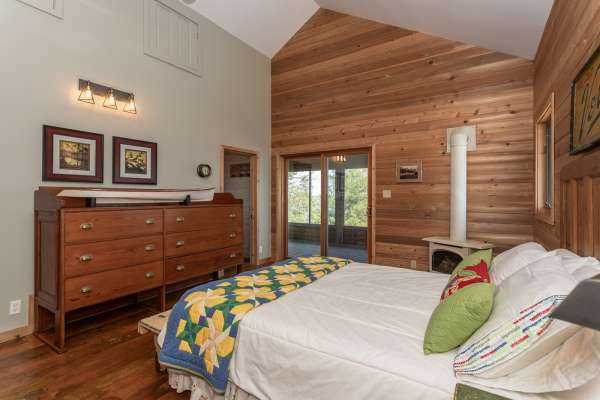 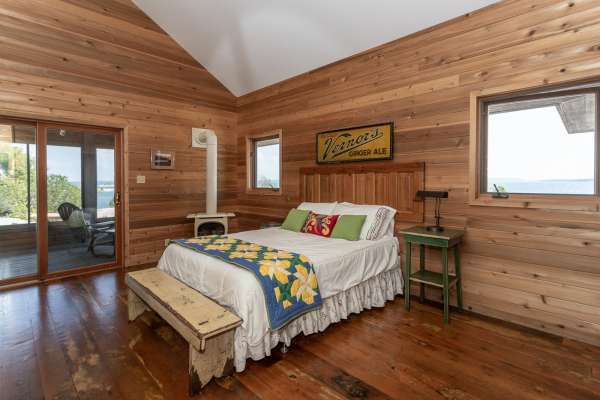 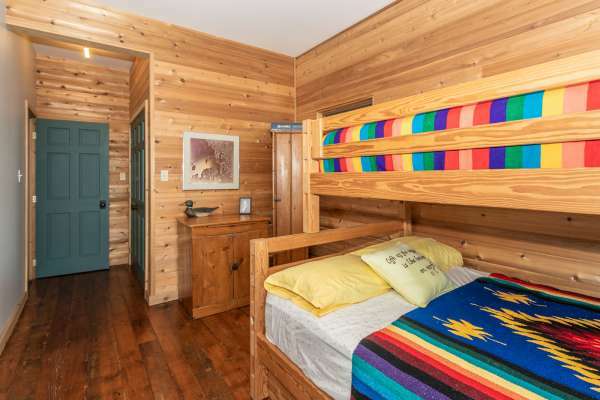 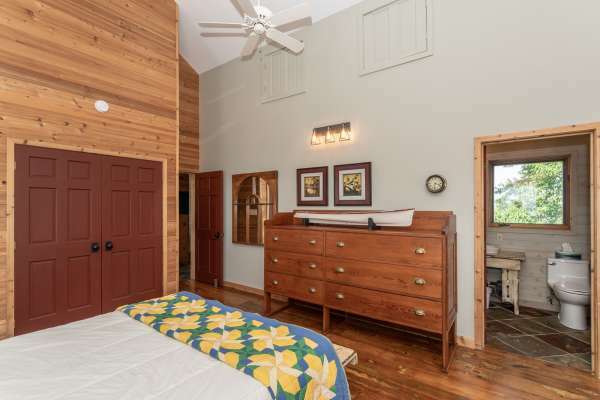 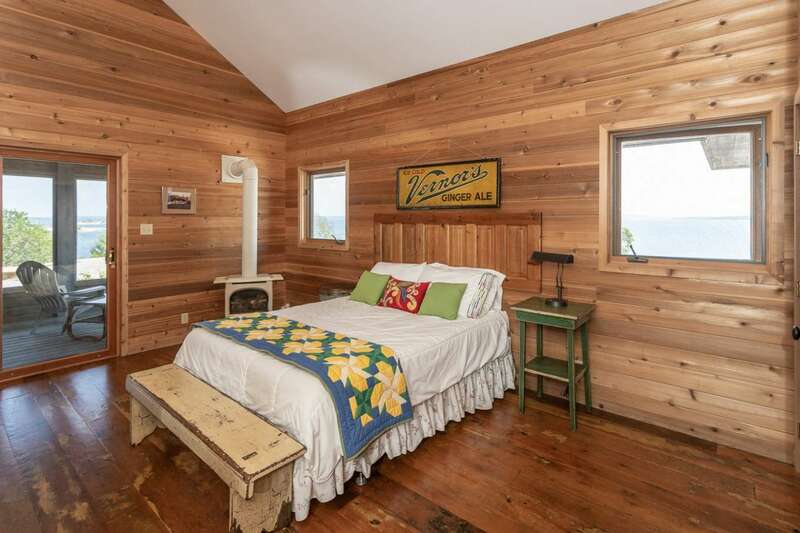 Majestic views are visible from every room, including the three bedrooms and two bathrooms. 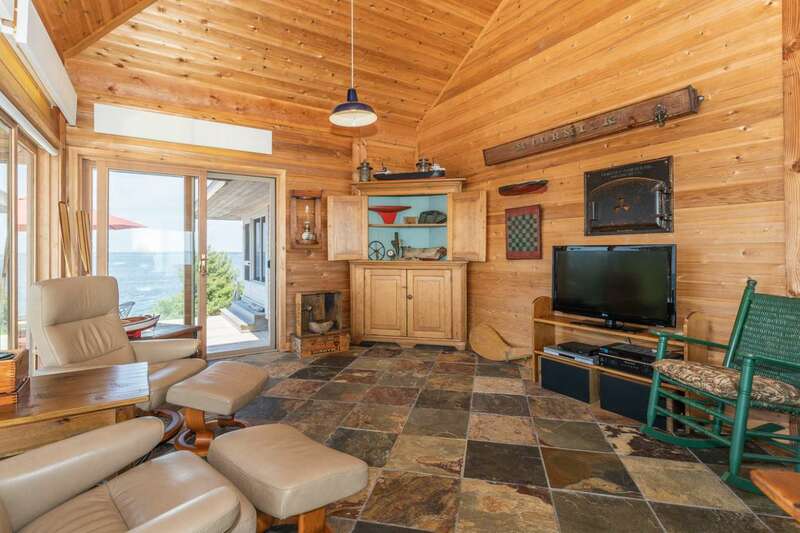 Two propane fireplaces guarantee a cozy stay, even when the crisp nip of autumn arrives in Canada. The open living room, dining area and kitchen flow seamlessly together, allowing ample space to entertain, while the bedrooms are in two private wings that extend south and east. A central staircase leads to a 12-foot by 12-foot lookout tower with views in every direction, taking in Hope Island, Giant’s Tomb Island, the Watchers, the Pines and the open bay. 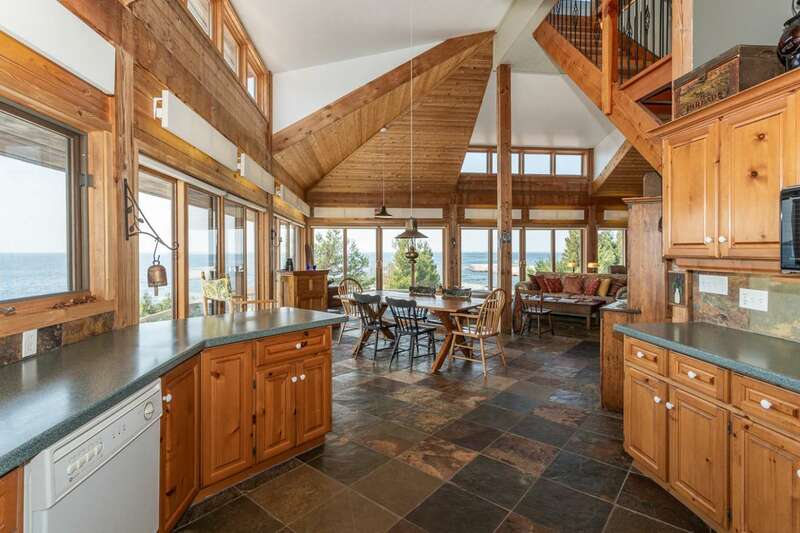 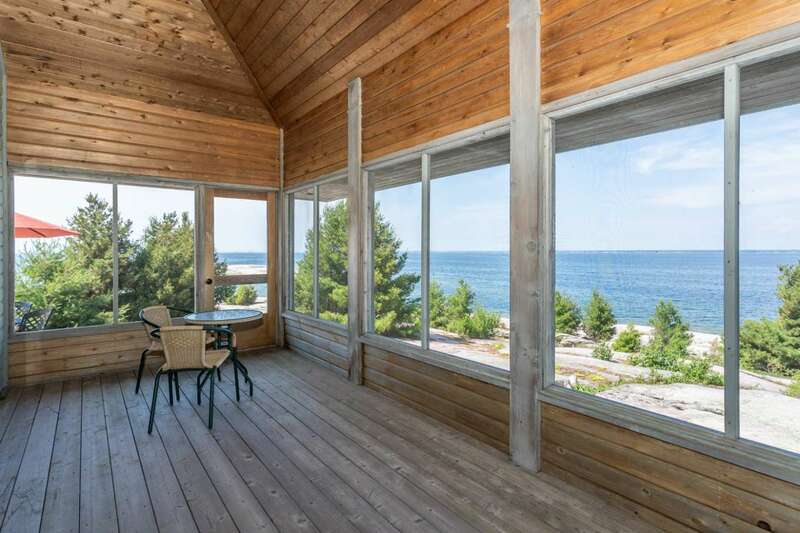 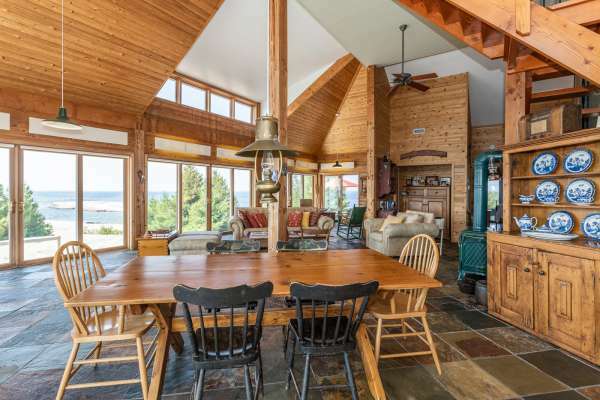 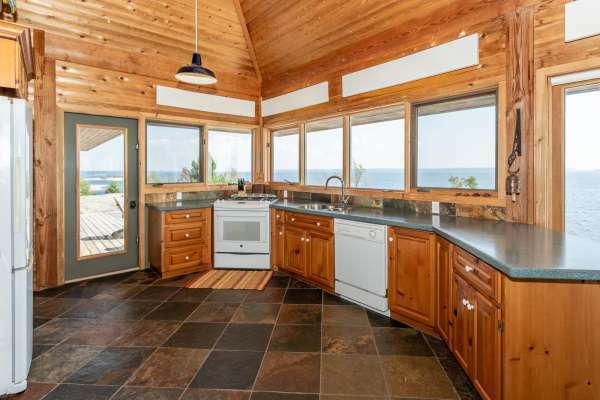 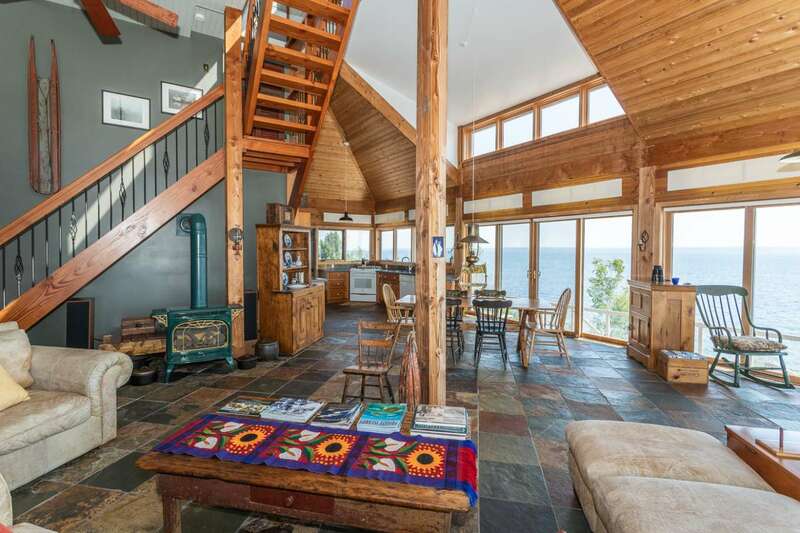 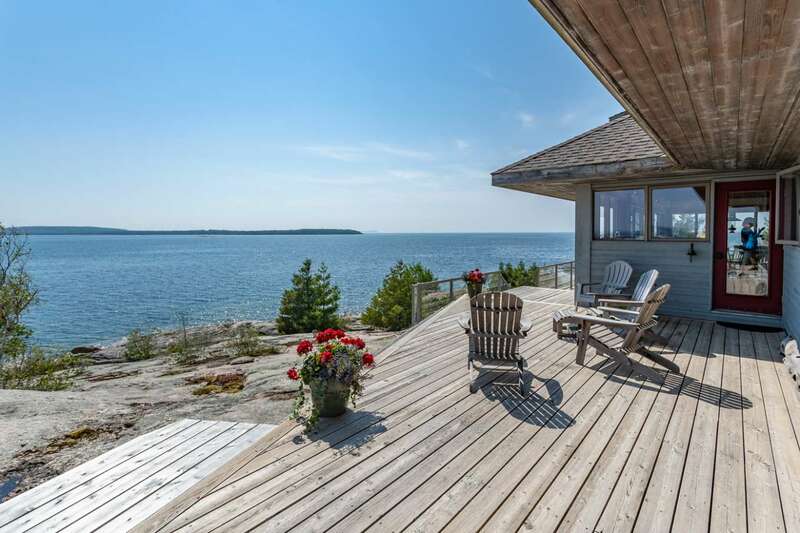 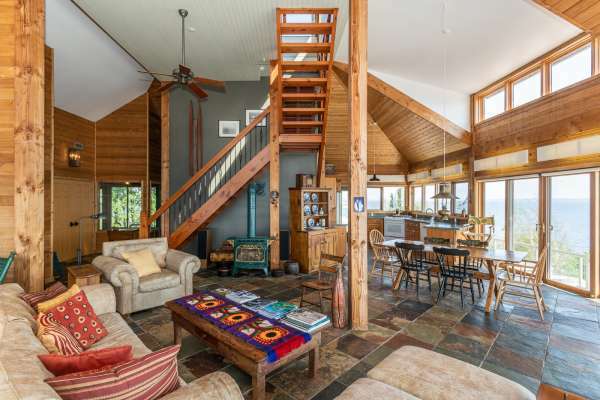 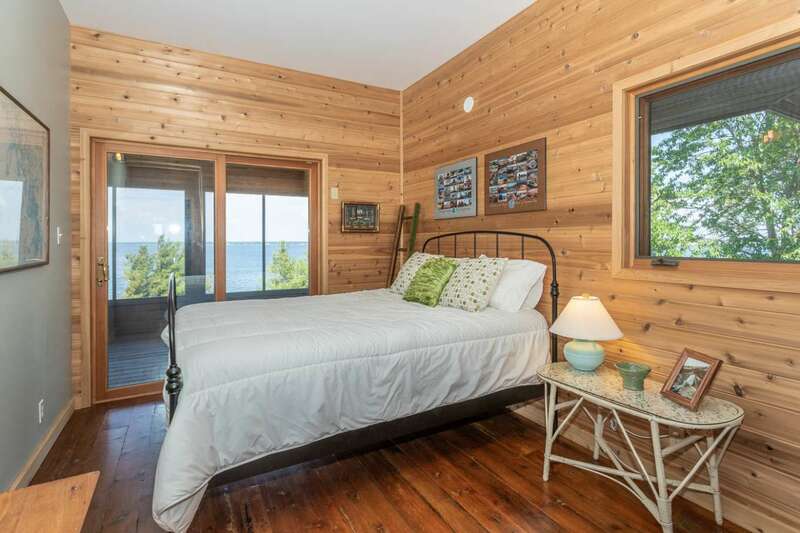 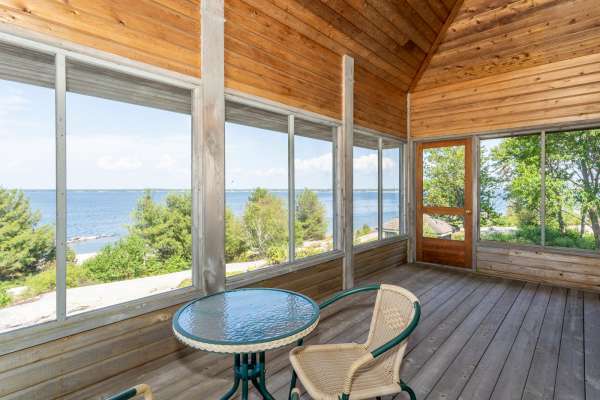 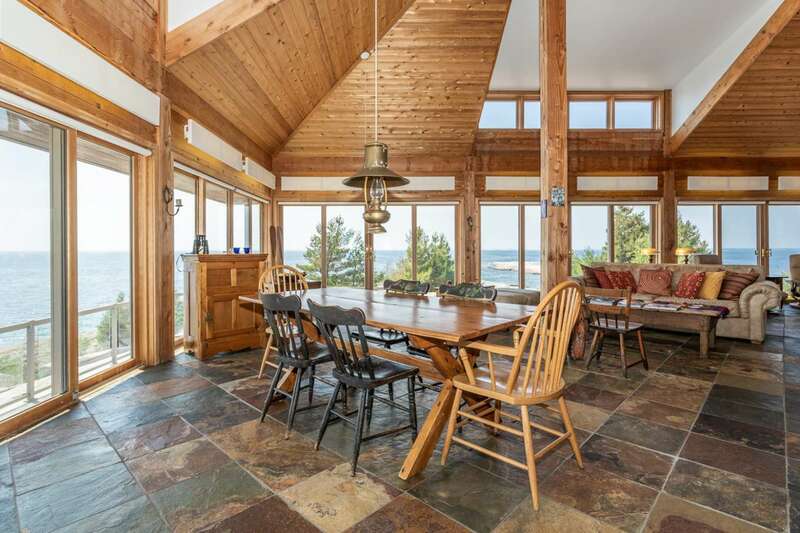 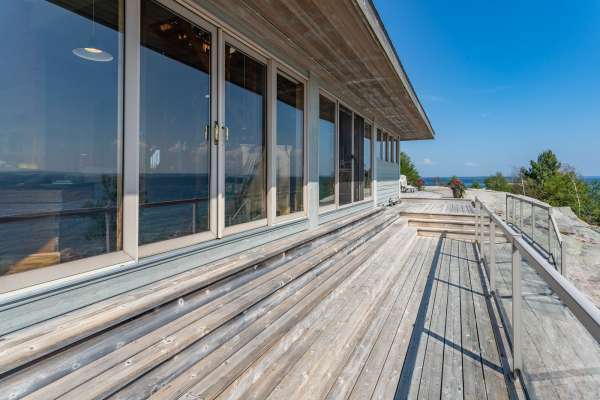 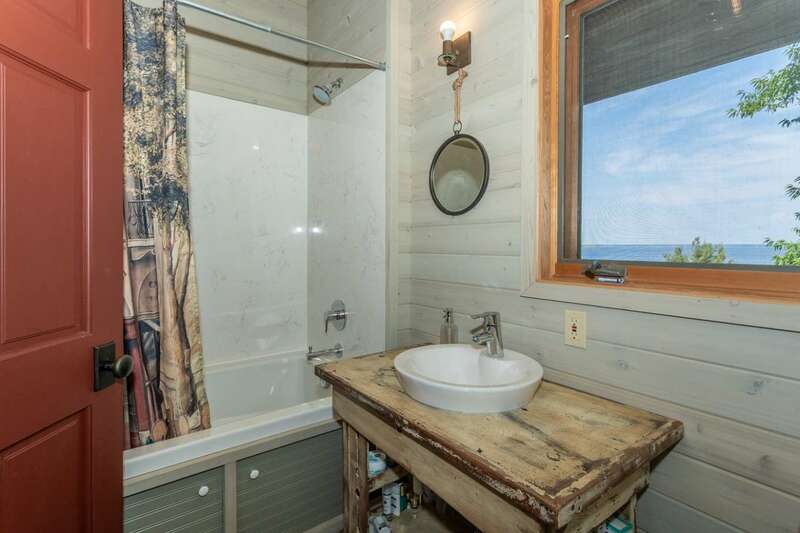 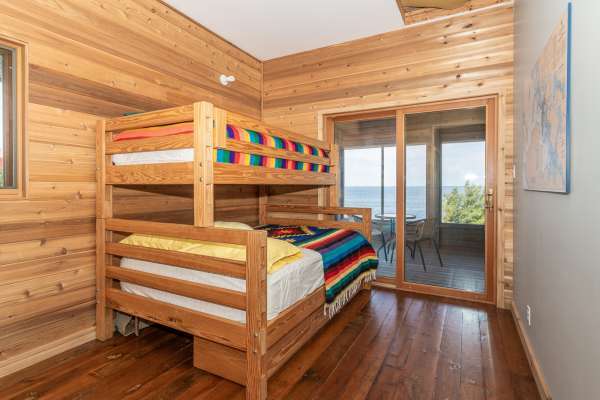 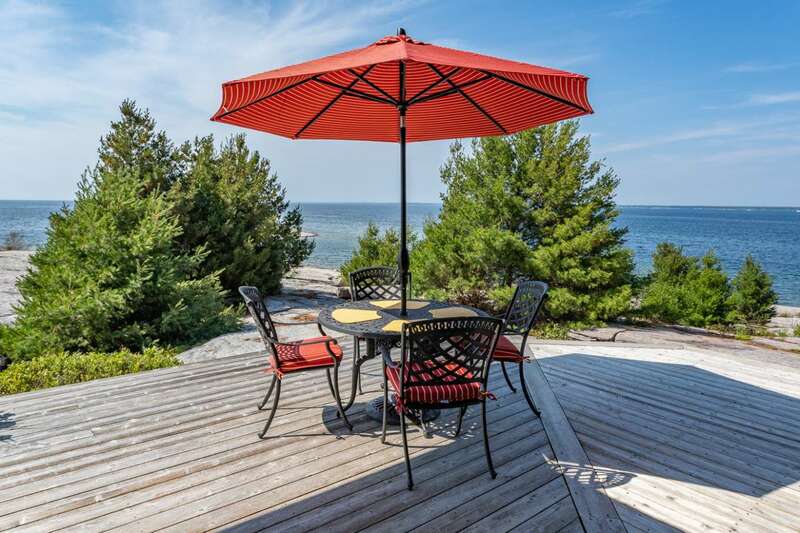 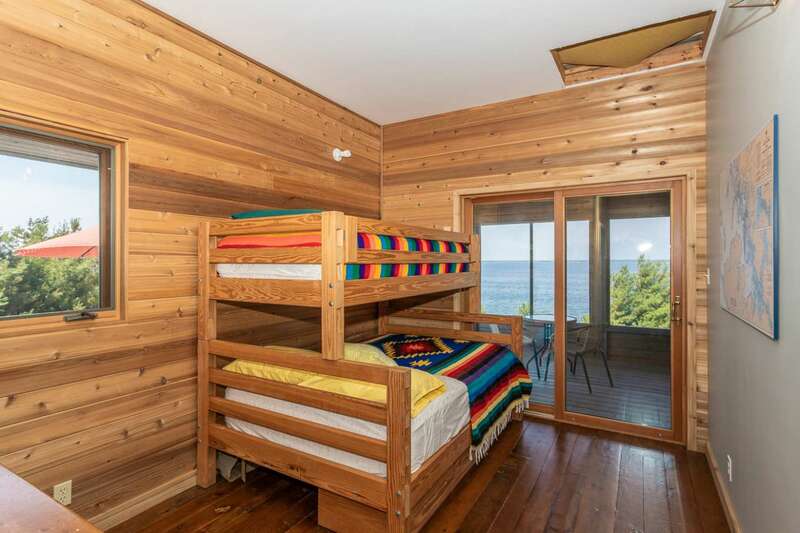 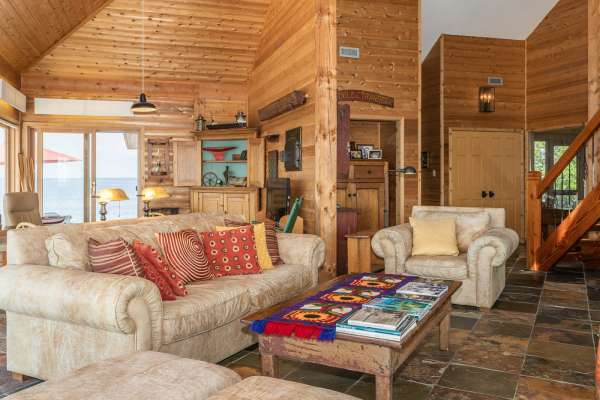 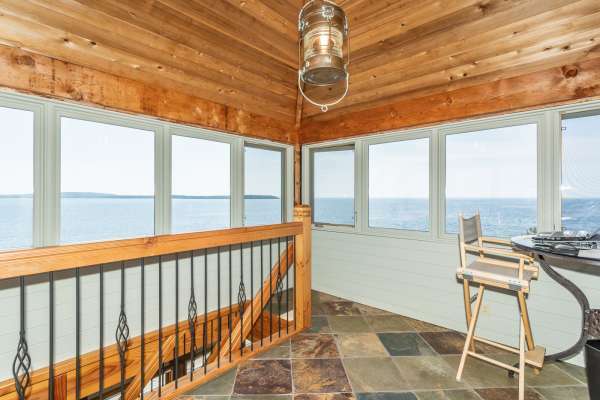 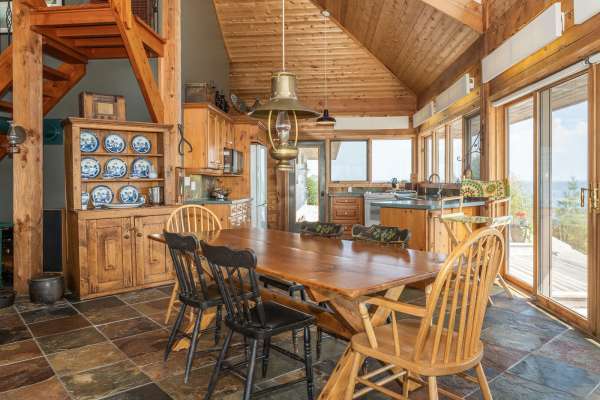 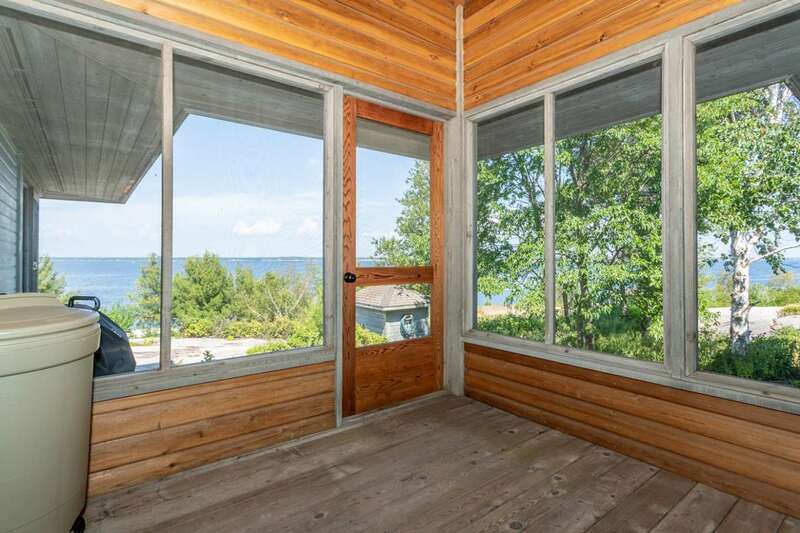 Three screened-in porches provide additional quiet spots to contemplate Georgian Bay’s legendary sunrises and sunsets. 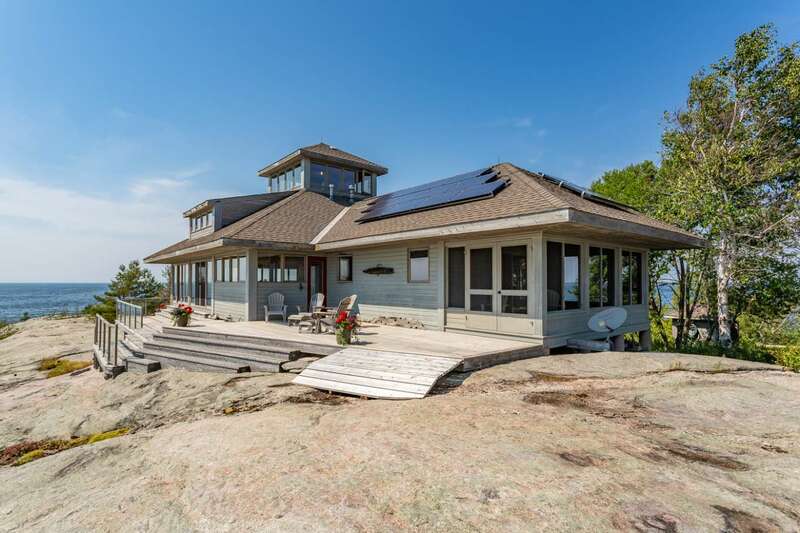 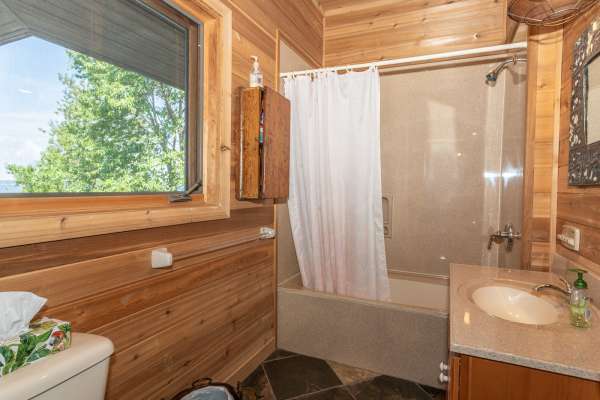 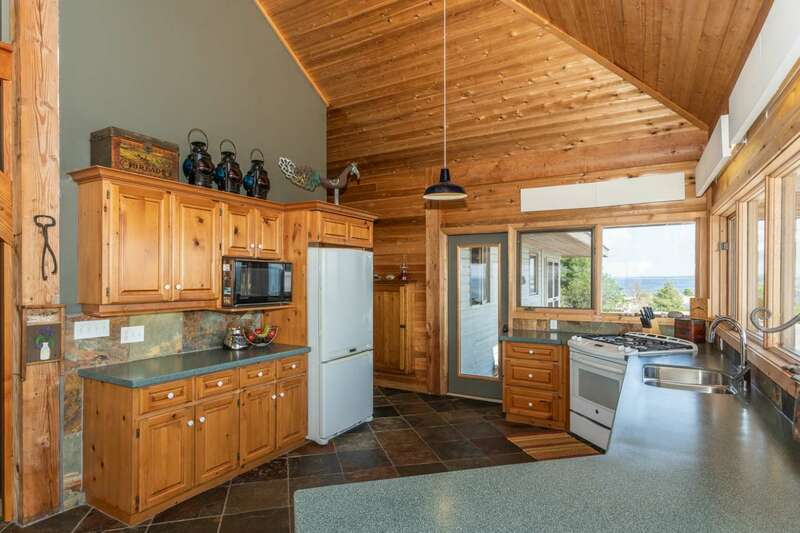 Completely off the grid, Eshpabekong Island operates on solar power, backup generator and propane, and has two septic systems already in place as well as a workshop/utility structure with sliding glass windows and surrounding decks. A 100-foot dock constructed of 16-inch steel I-beam and wooden decking ensures a safe arrival to the island sanctuary as well as a jumping off point to explore Georgian Bay’s 30,000 islands and more than 1,200 miles of shoreline. 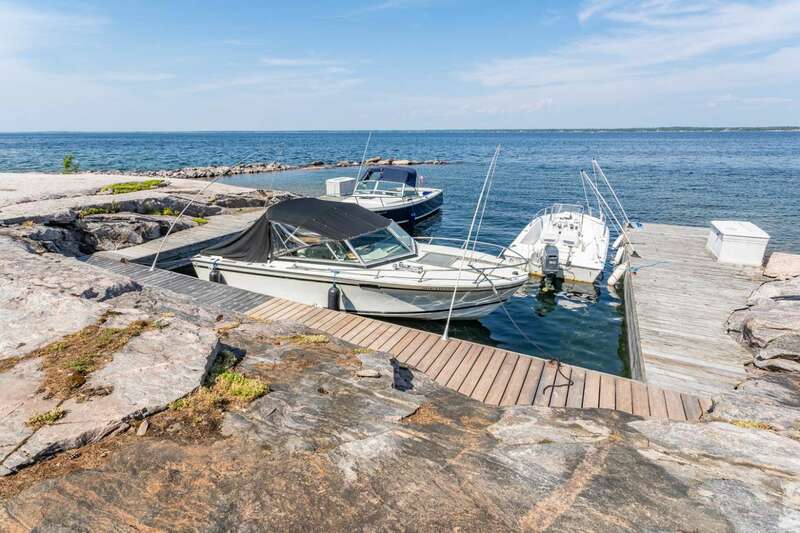 (Another 40 feet of dock is already built and ready to install.) 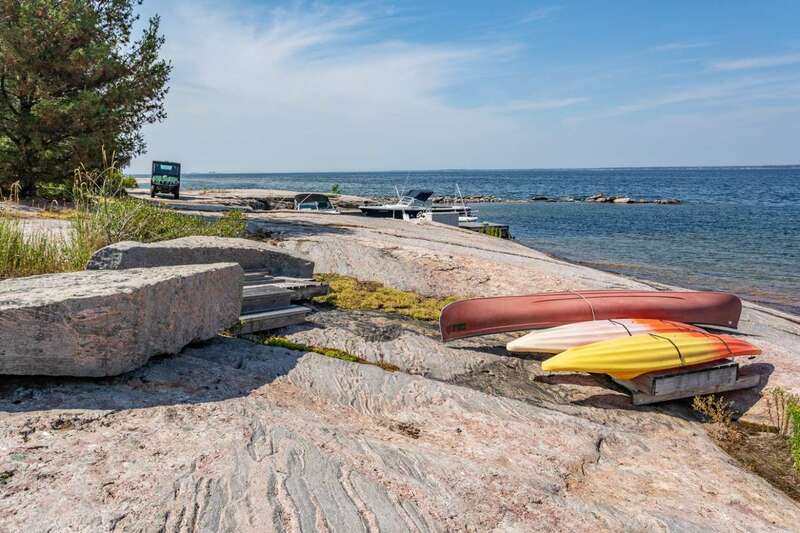 Municipal approval is secured for construction of a second main cottage and two sleeping cabins on the main island to create an expanded family-friendly compound. The three undeveloped islands are 3.6 acres, 1.72 acres, and 1.06 acres, and are covered in the same smooth granite as Eshpabekong Island, making the entire archipelago an effortless place to take a leisurely stroll or a brisk walk for exercise. 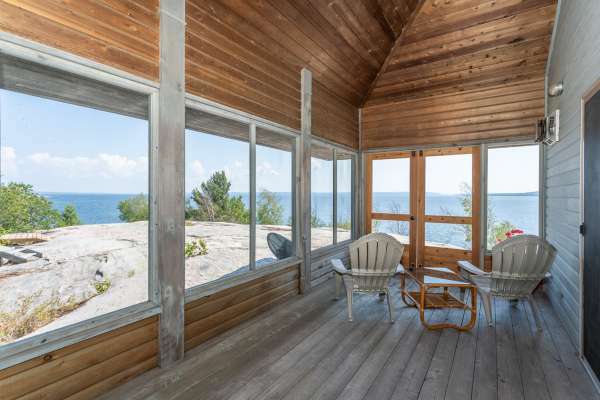 There are few places on earth where cottage culture is as celebrated as Georgian Bay, on the northeastern arm of Lake Huron. 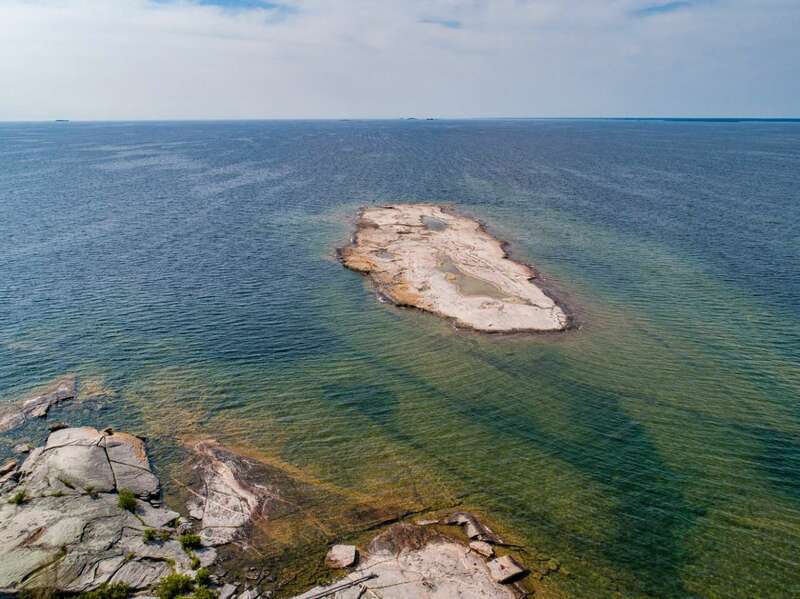 In this standout Great Lakes location, summers are devoted to boating, fishing, watersports and appreciating the natural features of one of the world’s largest bodies of fresh water. 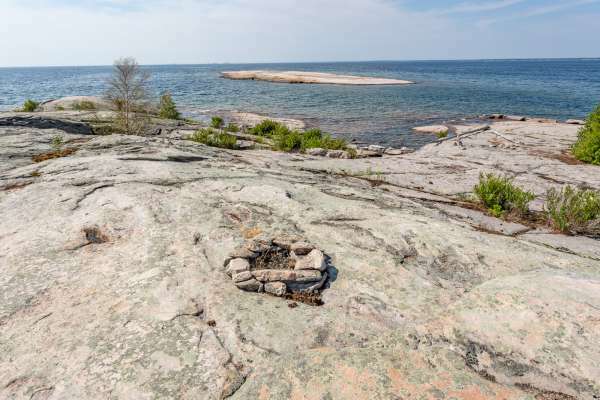 Eshpabekong Island provides a front-row seat for this wilderness wonderland, including unlimited swimming opportunities right off its shores and convenient access to Georgian Bay Islands National Park, with its well-marked cycling and hiking trails through forests of sugar maples, beech and conifers. 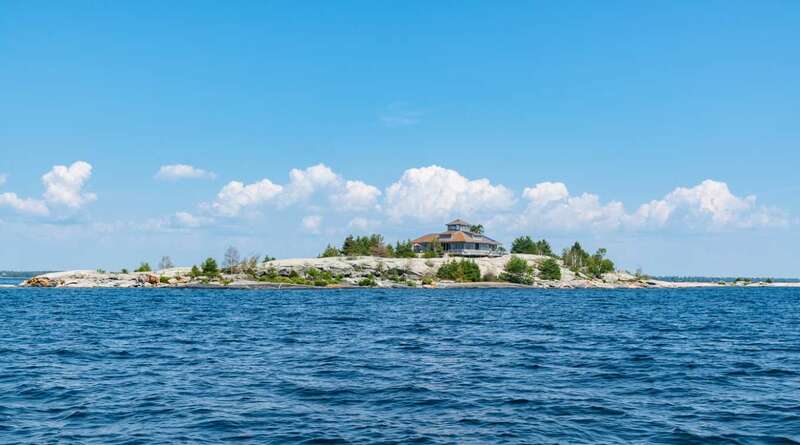 Best of all, Eshpabekong Island is two hours north of Toronto—including the boat ride—making a weekend break from the city as easy to coordinate as a long, luxurious holiday.